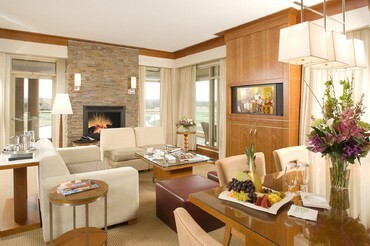 The Lodge at Turning Stone Resort Casino is an elegant all-suite hotel that’s perfected the art of pampering. This beautiful hideaway offers treasured privacy that superbly complements the Resort’s recreational pleasures. Your sumptuous suite is just mere steps from fun and excitement, yet still a serene world away. Upon arriving at The Lodge, our professional staff is ready to greet and assist you with our complimentary valet parking and then present you with ‘’Welcome” chocolates and a seasonal beverage at Reception. Your exquisite suite will be prepared for you with a number of amenities including an in-room safe, minibar, robes, Keurig coffee maker, Saratoga water and complimentary Wi-Fi. As a guest at The Lodge, you will be provided with access to The Lodge pool, hot tub and exercise facility. Each morning the newspaper will be delivered to you and we invite you to relax in the Great Room for complimentary coffee and tea services. Once evening descends on the Resort, you are invited to the nightly and unique s’more roast on the Great Lawn Patio (weather permitting). The Lodge staff will also prepare your room with our nightly turndown service. Turning Stone Resort Casino is proud to say The Lodge is a winner of the Forbes Travel Guide Four Star Award and AAA Four Diamond Award. If there is anything else you need during your stay, our staff is ready to assist. Our Easter Sunday special is sure to put a spring in your step! Enjoy 30% off our regular room rate at The Lodge on Sunday, April 21! Call 800.771.7711 for reservations and more information. The epitome of elegance at The Lodge, the Presidential Suite provides extraordinary comfort in a two-story, 2,900 square-foot design. It includes three bedrooms, three and one-half baths, two fireplaces, an entertainment center with home theater system, and an expansive balcony with hot tub overlooking Kaluhyat Golf Club. 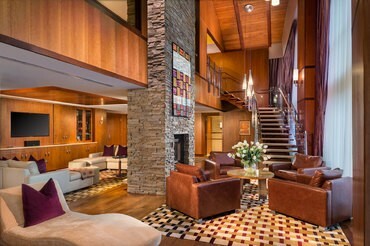 A soaring two-story glass walled living room faces the Great Lawn, and the suite also has a full kitchen adjacent to a large dining table setting. The second floor master bedroom features a mini spa with hot tub, steam shower, sauna, and walk-in dressing room. Butler service is available. To book the Presidential Suite, please call 800.771.7711. These spacious, 800 square-foot corner suites each offer a wrap-around balcony and several sets of teak chairs and tables. Available with a King size bed only, these gracious accommodations also include a half bath off the separate living room, gas fireplace, dining table with chairs, entry with wood flooring, wet bar, and a large living room seating area. Slightly larger than our Lodge Suites, at approximately 660 sq. ft., these charming accommodations with a single King bed face the Shenendoah Golf Clubhouse and pond. Several also have a double-sided gas fireplace. These luxurious two-room suites average 550 sq. ft. and feature separate living room and bedroom, with one king bed or two double beds. Ten-foot-high ceilings, floor-to-ceiling windows, wood-and-frosted French doors separating the living quarters, and marble accented pass-through bath that includes a glass enclosed shower and soaking tub are among the appealing interior design enhancements of these accommodations. Many suites also offer a balcony or terrace with teak deck furniture. The Concierge at Turning Stone Resort Casino can assist you in creating the most memorable experience while visiting our wonderful property. Let us accommodate your special requests to make your stay exceed all expectations. Please call our toll free number, 800.771.7711 and ask for a concierge. Choice of toast or English Muffin. Egg whites available upon request. Served daily 11:00am – 10:00pm. Call 315.202.3200. Late night serves only snacks, sandwiches and burgers. With french fries, chips or salad. Menu items are subject to change without notice due to seasonality. Please ask our staff for specials or menu items available from our dining room menu. All room service orders are subject to a • $2.50 service charge, 8.75% sales tax and 18% gratuity. The consumption of under cooked or raw seafood or meat may increase your risk for food borne illness. Late Night serves only snacks, sandwiches and burgers. Alcoholic beverages can be served after 10:00am on Sundays.